An open mic is scheduled on Oct. 19 at 7 p.m. at 193 Coffeehouse in the Memorial Union at the University of Rhode Island to address domestic violence awareness. The event, “Shatter the Silence,” is hosted by Ether(bound) literary magazine, Peers Learning Educating and Supporting Everyone (PLEASE), Slam Poetry Club and the outside organization, Sisters Overcoming Abusive Relationships (SOAR). Ether(bound) is a student run online literary magazine that showcases creative student writing and visual art. 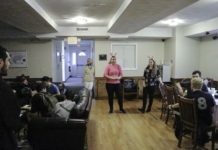 The organization seeks to create a source for a creative community around campus. PLEASE is a group of trained students in educating, facilitating and advocating for campus issues involving stalking and sexual and relationship violence. Jackson hopes that the event will bring a voice for victims and those impacted by domestic violence. October is the National Domestic Violence Awareness Month and so “Shatter the Silence” will be focusing their efforts around creating safe place for domestic violence victims to talk about their experiences and express themselves. There will also be a guest speaker brought in by SOAR to speak at the event. Although the event is centered around domestic violence, everyone is welcome to come and listen to experiences being shared or to meet members of the hosting organizations. Anyone can perform a piece on any topic of their choosing, regardless if it connects with domestic violence. If you have questions about reading or volunteering for the event, send an email to etherboundmag@gmail.com.